Note from Davonne: I have received an unbelievable amount of messy photos and questions for the Get-Organized challenge. I just want to extend a huge THANK YOU to everybody who has jumped on board with participating! In order to answer the responses in a timely manner without nearly killing myself, I’ve decided to bring in a few experts to help me out. Today’s messy situation is being handled by Keri from Living in this Season – make sure to check her blog out because it’s a great one! “This area is pretty much our whole lives. It’s so overwhelming that I can’t even think of specific questions to ask. We have a toy rotation system for 2, 4, and 6 year old boys (because their room was a disaster!) and a 4 x 4 cube of homeschool books, games, and craft materials. School is done on a table in front of the cube, plus there are potted plant materials and reflective material on top of fridge because no outdoor storage is available. The file cabinet holds three bins full of papers and odds and ends. The low wooden cabinet houses a recently organized sewing machine, serger, thread, etc. On top of wooden cabinet is 12 year old boy’s school area with laptop, workbox, and clip board box. There’s also laundry yet to be put away on the chair in front of wooden cabinet. First, we will focus on the toy rotation system. I love the idea of rotating in and out toys as it does help with the toy overload. I also am a big believer in sorting toys and getting rid of excess. 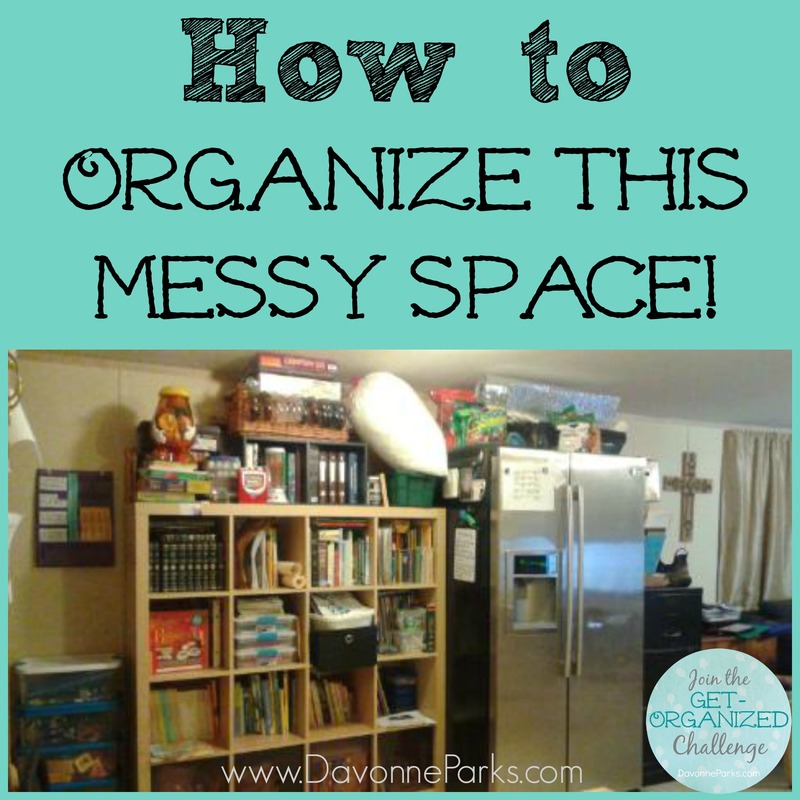 I love Davonne’s tips for organizing toys. Her tips are exactly what you need to read before you go through the toys! Purchasing storage containers can add up, but there is also a lot you can create on your own. Empty cereal boxes can be turned into book holders, paper holders, etc. Or you can use items you already have that can be used as-is! Davonne also shares about creating a simple binder for each child to hold their school papers. I actually started using this system this year and I love how easy it is! Third, we will discuss the items on the fridge. You stated there is no outdoor storage available. For these situations, I love using baskets to hide what may be inside. Goodwill has a lot of options of baskets that you can use. You can even create a little label to hang on the outside to remind you what is in the basket. Fourth, we will discuss the papers you shared about. One way, I like to keep my papers organized is using my home life binder and my organization station files. Every Sunday evening, I go through my files in my organization station and then put the items where they need to go. This helps calm the paper load. You can also read Davonne’s article about how to handle paper-clutter here. Fifth, we will discuss the wooden cabinet that is your older son’s school area. It sounds like things are pretty organized in this section. One idea would be to give each child a cube in your cube shelves and that can be where their school stuff is located. Finally, we will talk about the laundry. I know laundry can pile up and without a laundry room there is little way to hide what needs to be cleaned or folded. One thing I try to practice is when I take it out of the dryer, I quickly fold it. I know some moms who will then place the laundry in specific baskets for the children to then take to their rooms to put away. I hope these ideas will be helpful for you! I would love to talk to you more about your space and if you need further assistance. Please hop on over to Living In This Season and say hi! PS Don’t forget that if you submit your own mess, you’ll receive a free copy of Chaos to Clutter-Free, plus you’ll be entered into a drawing to win a $50 Amazon Gift Card! Details and submission information are here. These are great tips Kerri!! I agree! She did a great job! Thank you for covering our mess. I love your tips and have actually read them before and used them in other areas of our home. Somehow this one area just overwhelmed me to the point of forgetting everything I had already learned! I plan on working on this area in the coming week. I now look forward to tackling this mess! I’m so glad Keri’s tips were helpful to you Saira! Sometimes we could all use a refresher course when we’re overwhelmed 🙂 We can’t wait to hear your success story when you’re finished!